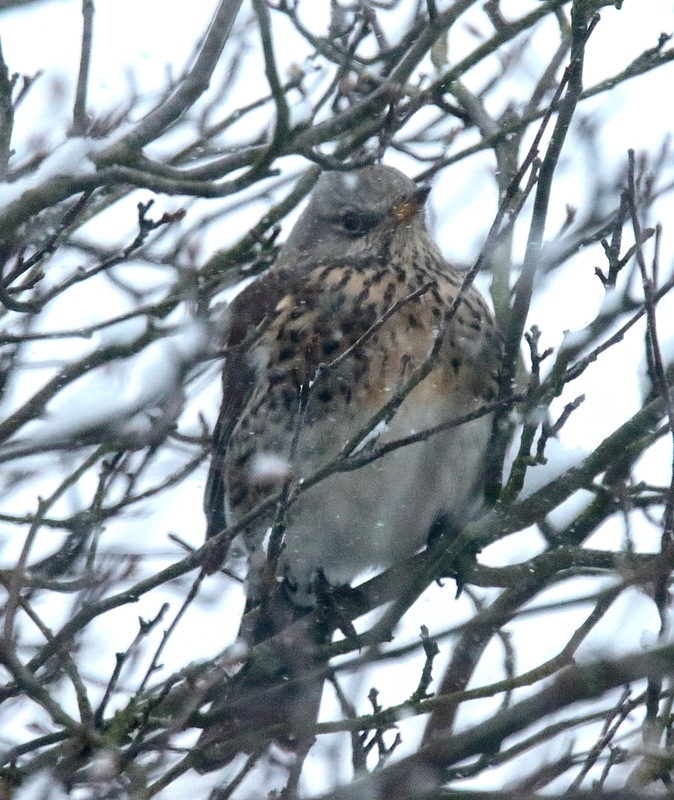 Fieldfares, named from the Anglo-Saxon ‘fieldware’ or ‘traveller of the fields’ may come in from the fields and woods in this weather, as 13 did today, sweeping into our garden during a blizzard (hence the indistinct photo’s!). 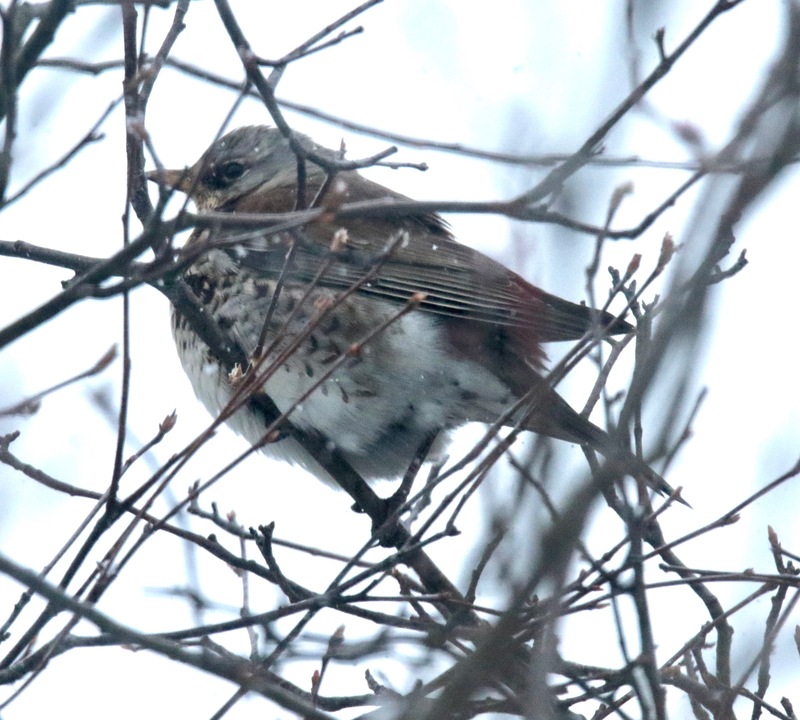 Breeding in Scandinavia, Fieldfares, about the size of Mistle Thrushes, migrate to the UK to overwinter. 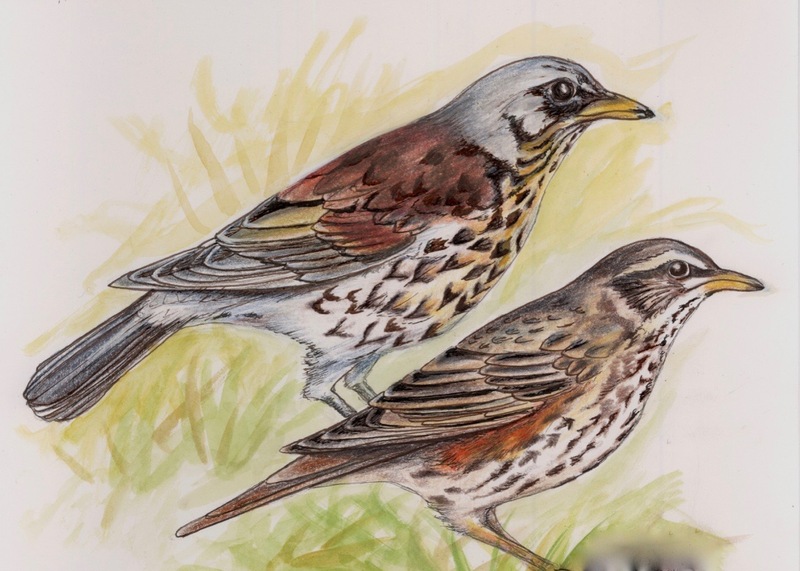 They are sometimes in mixed flocks with our other over-wintering Thrush, the smaller Redwing- the Fieldfare is the larger bird in this drawing, to scale alongside the Redwing, which we get more frequently in our winter garden. 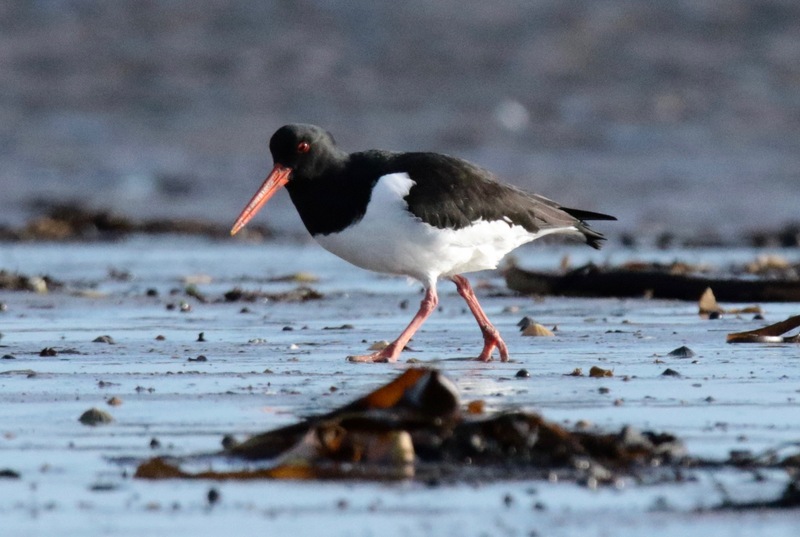 Condition: Heavy snow showers, driving breezes and sunny intervals. 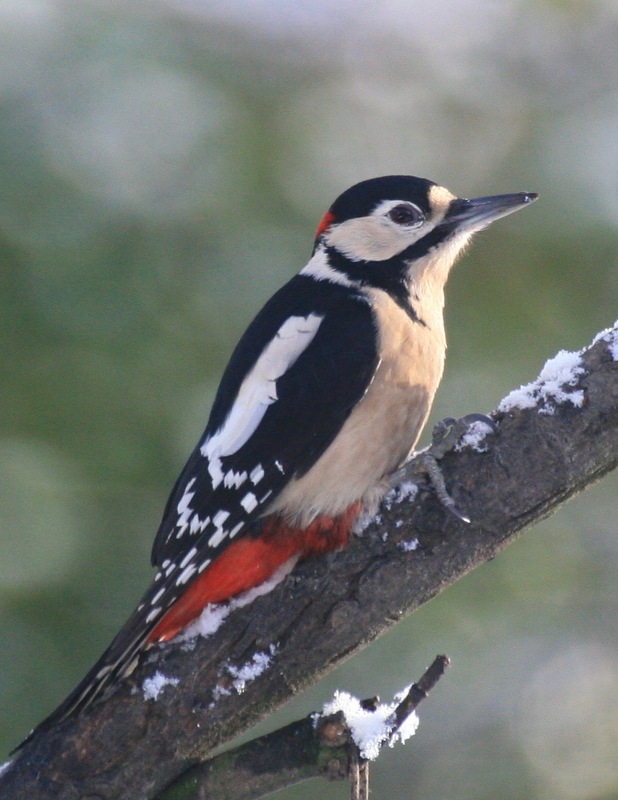 Temperature: Max -4 Min -5 C.
come near enough in our garden to photograph, this one turned up briefly on our Rowan trunk. 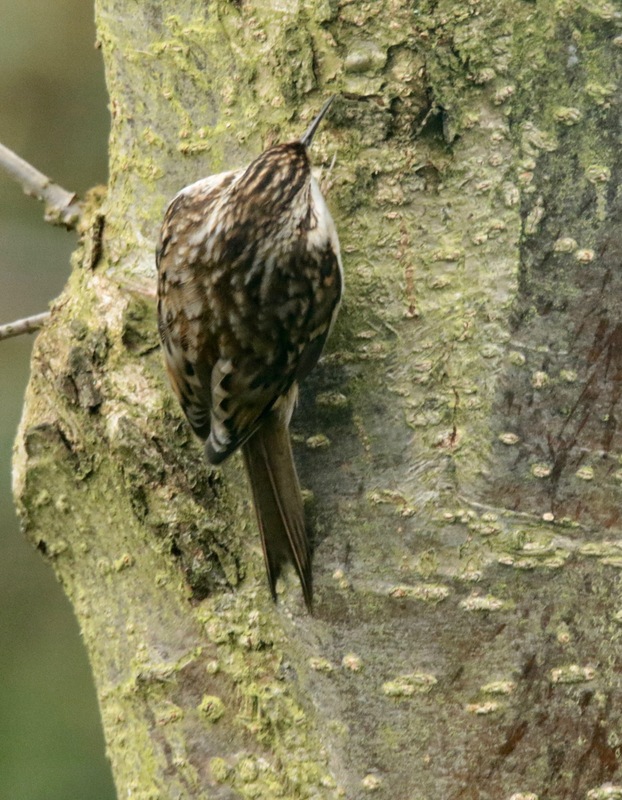 Treecreepers can suffer in cold winters if wet conditions are followed by freezing temperatures as tree trunks, where they forage for insects, get ice-bound, which means those in sheltered woodland fare better. 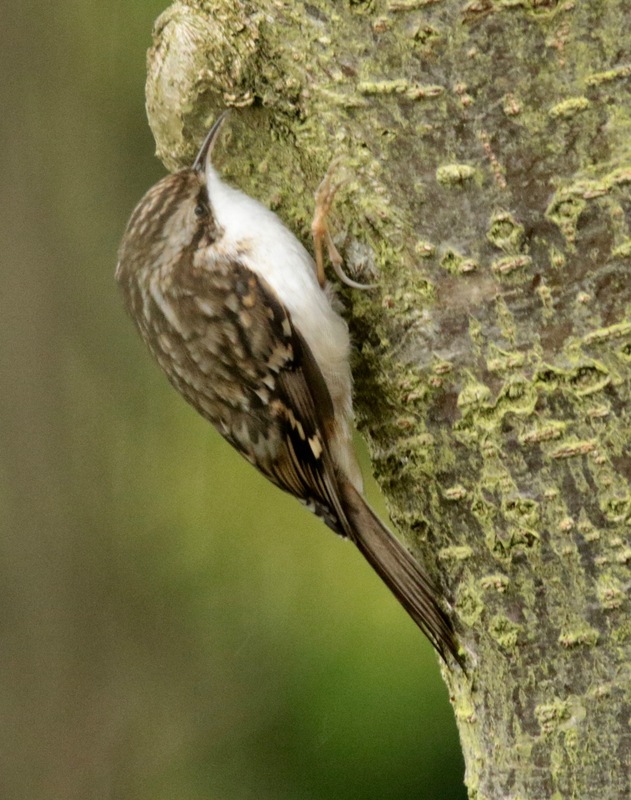 Tree creepers move rapidly in spirals round a tree, and only move up the trunks, unlike Nuthatches. They move fast, which is why the photo’s aren’t that sharp! Conditions: Sunny intervals. Temperature: Max 4 Min -1C.
. 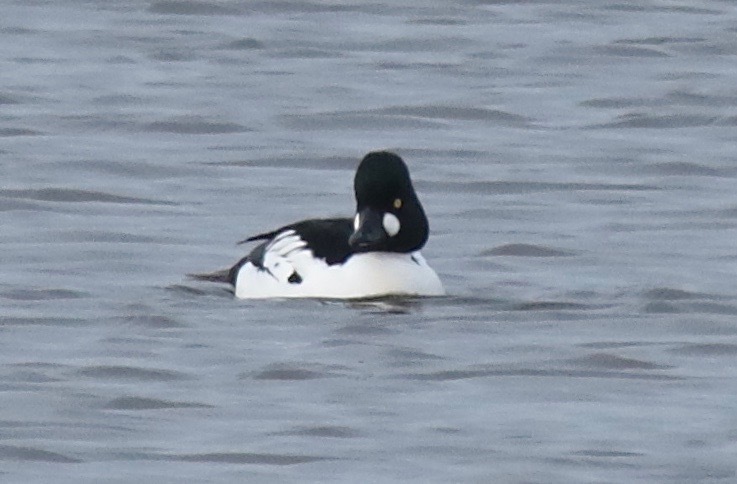 Males have iridescent heads- studies suggest iridescence is related to testosterone levels, which may explain why heads look blacker in winter. 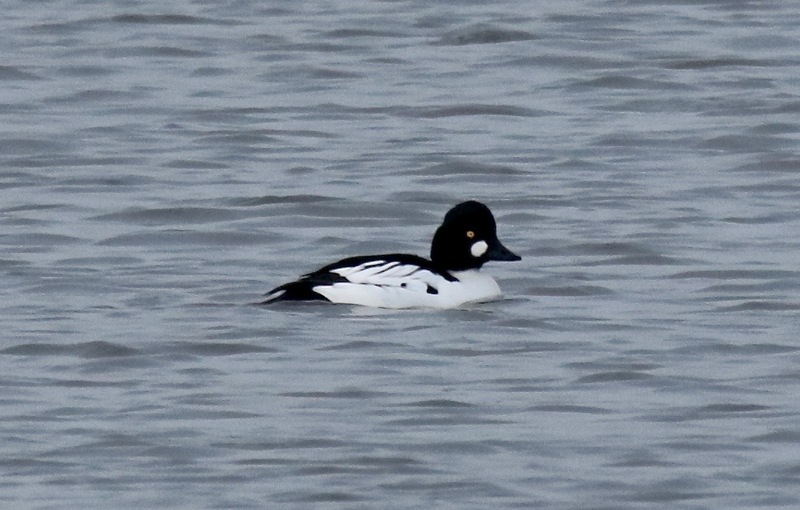 The white cheek patch helps identification. 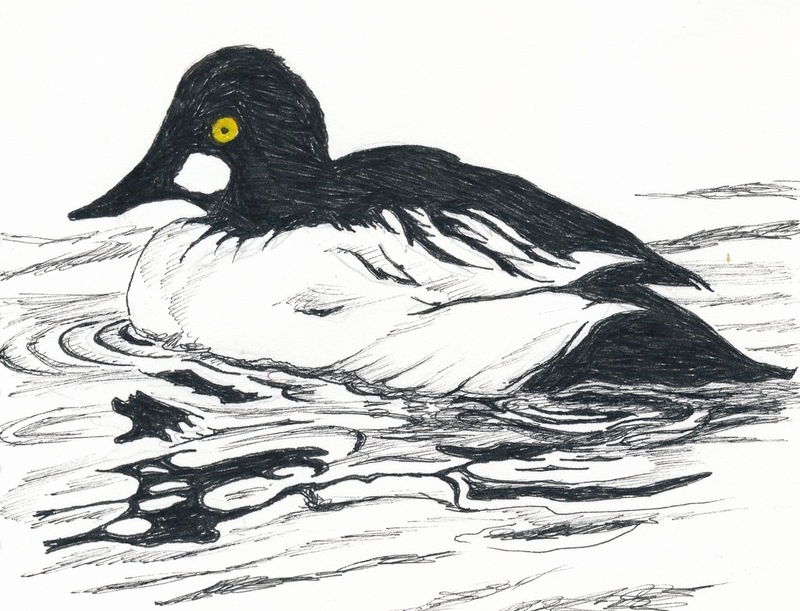 Goldeneye first nested in Scotland in 1970– nest-boxes in trees near lakes has increased the small number of breeding to 200 pairs. Conditions: Cold with some sun. Temperature: Max 4 Min -2C. 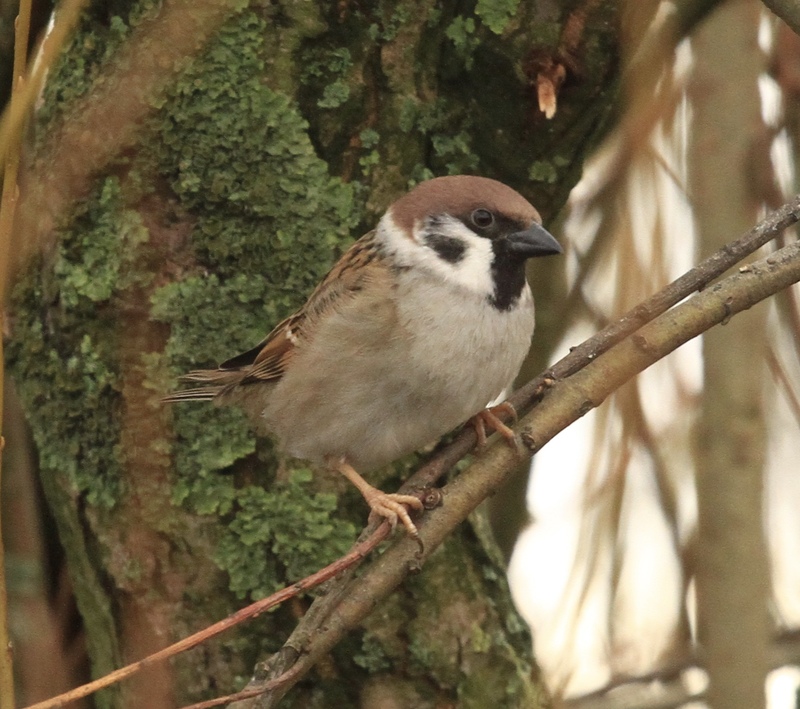 The lovely Tree Sparrow is making a slow recovery after a catastrophic decline of 93% between 1970 and 2008. 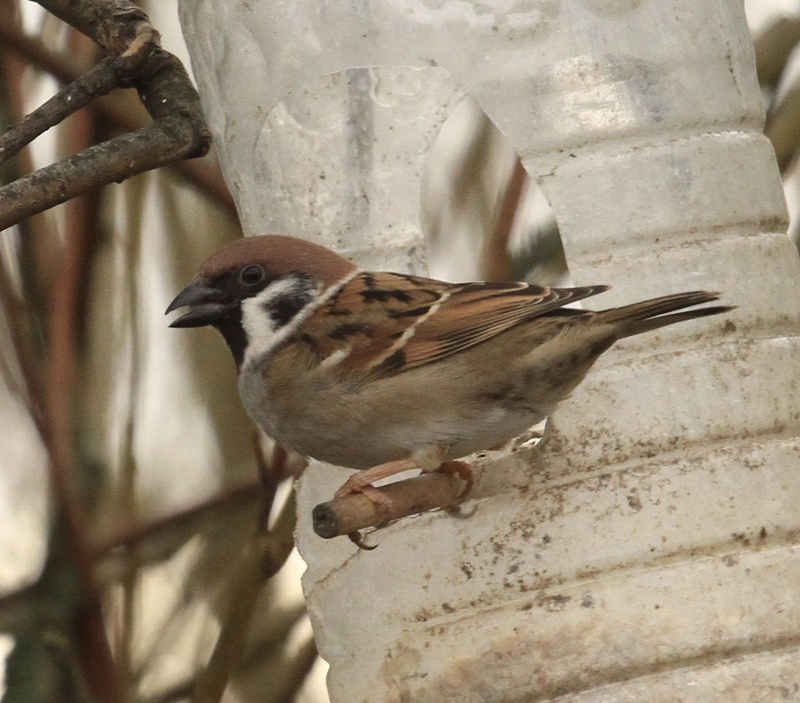 Both male and female Tree Sparrows have a brown cap and a dark spot on their pale cheek, compared to the grey cap of the male House Sparrow. 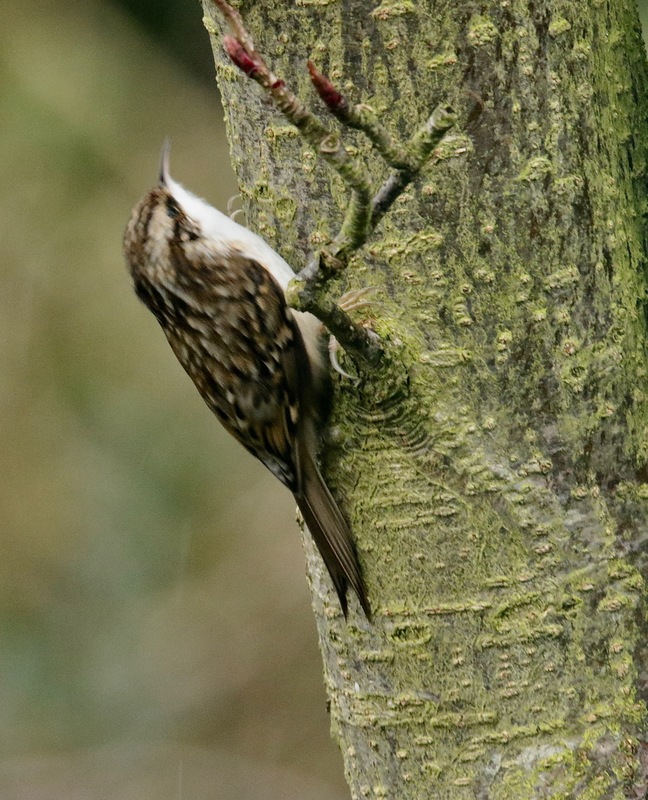 Both birds can be encouraged to nest by putting up groups of boxes. 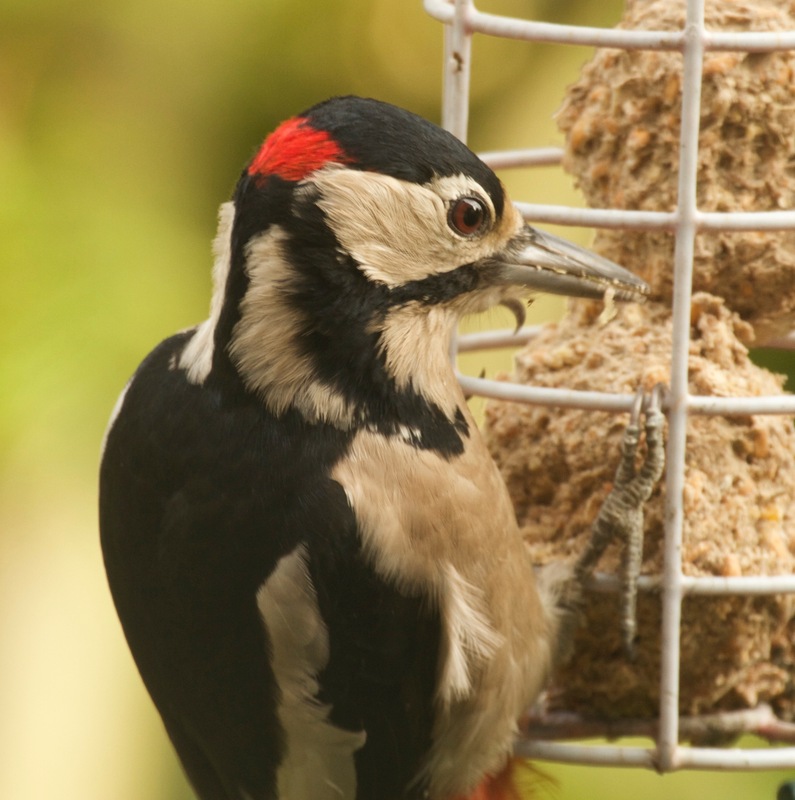 It is nest- box time, and you can look up various birds’ needs on the BTO site. 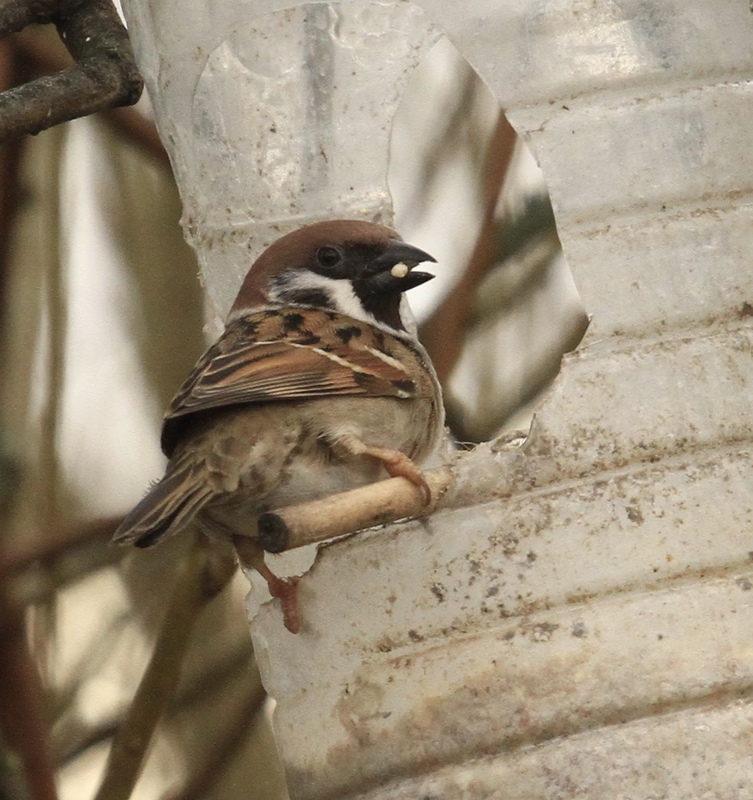 I watched these at Druridge Bay on the NE coast where they use simple bird feeders made from plastic bottles. Conditions: some sunny intervals amid the cloudy skies. Temperature:Max 7- Min 2c. 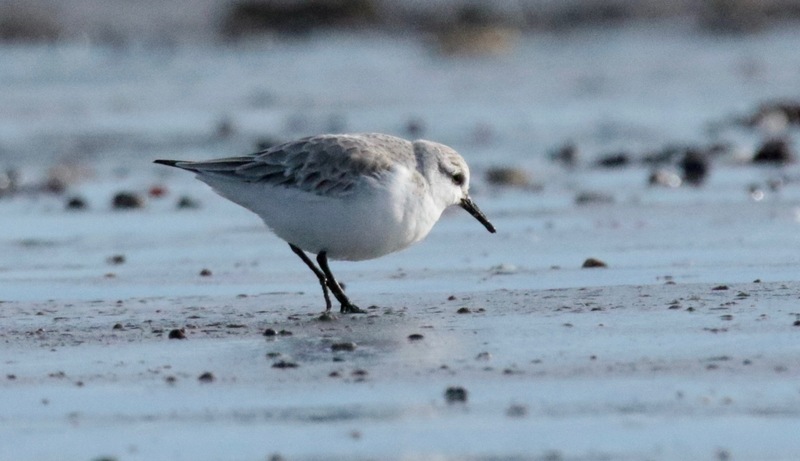 Watching waders like these Ringed Plover, Sanderling and Dunlin, along the winter shore is such a treat. 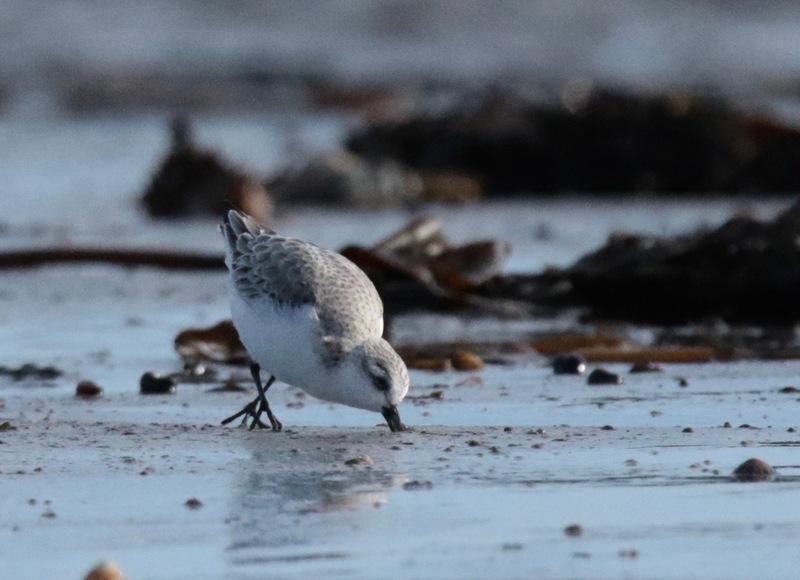 Not only do they have different length bills so that they don’t compete for food, they have many sensitive nerve endings at the end of their bills, allowing them to detect the pressure-waves from prey as they rapidly ‘stitch’ the mud and sand, in a search for small invertebrates (see photo’s)- a bit like echo location in bats. Conditions: Sunny spells replaced by dull cloud and drizzle. Temperature: Max 9- Min 5C. 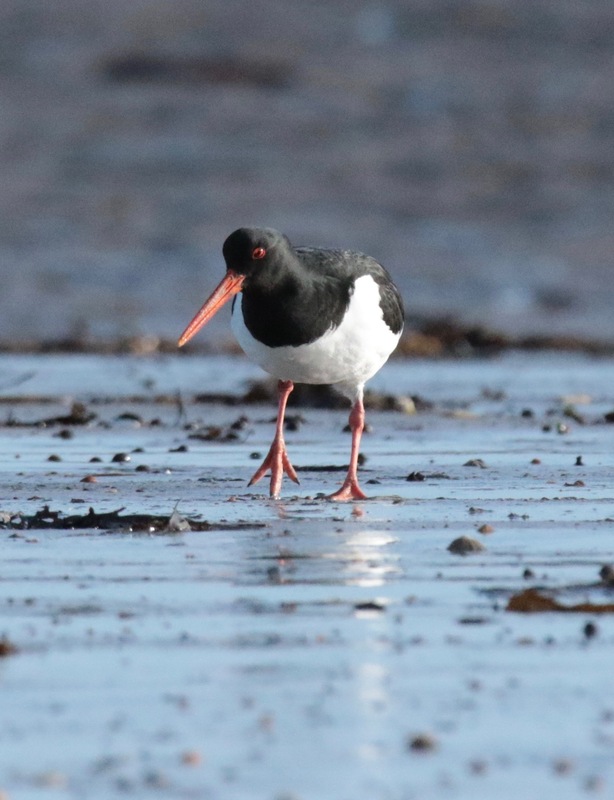 Oyster Catchers are our most easily seen and identified waders– 45% of the European population overwinters on our coasts, and it was great to see them feeding, and hear their evocative peeping calls, in Northumberland yesterday. 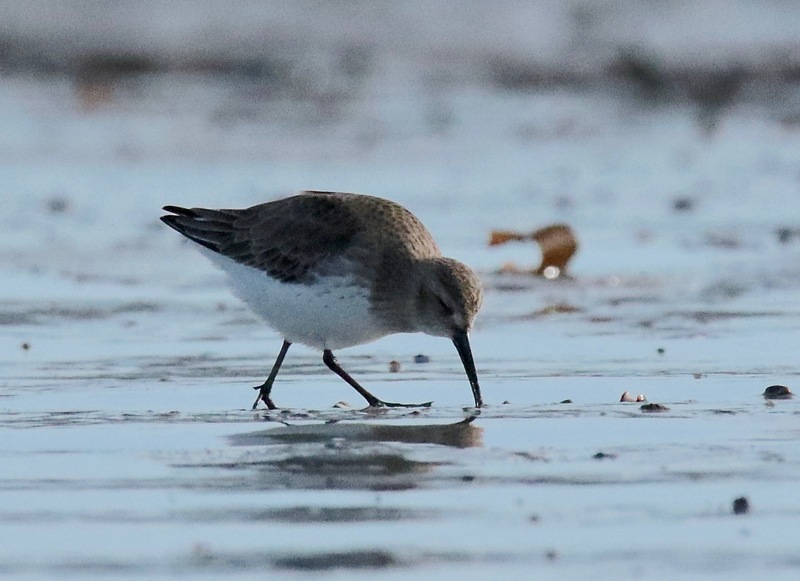 Their strong, long bills enable them to probe deep into sand, and to break open Mussels and Cockles. 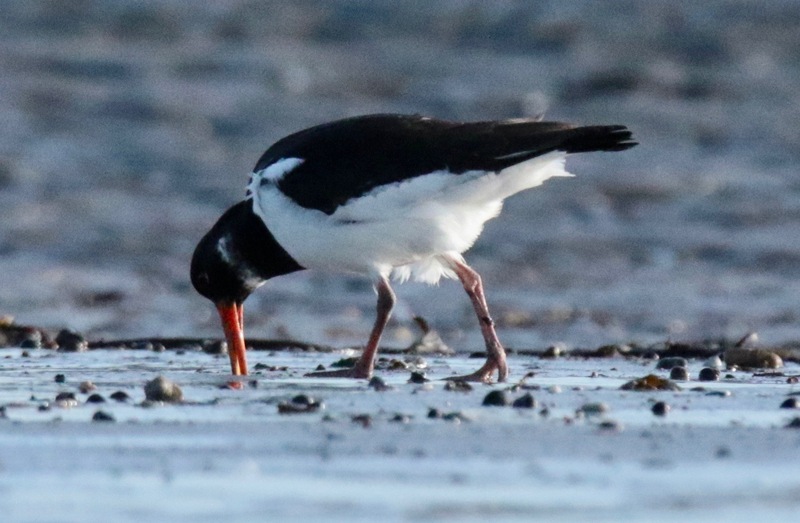 Increasingly breeding inland, they also feast on worms in summer. Conditions: Glorious sun and strong westerly breezes. Temperature: Max 7- Min 0C. 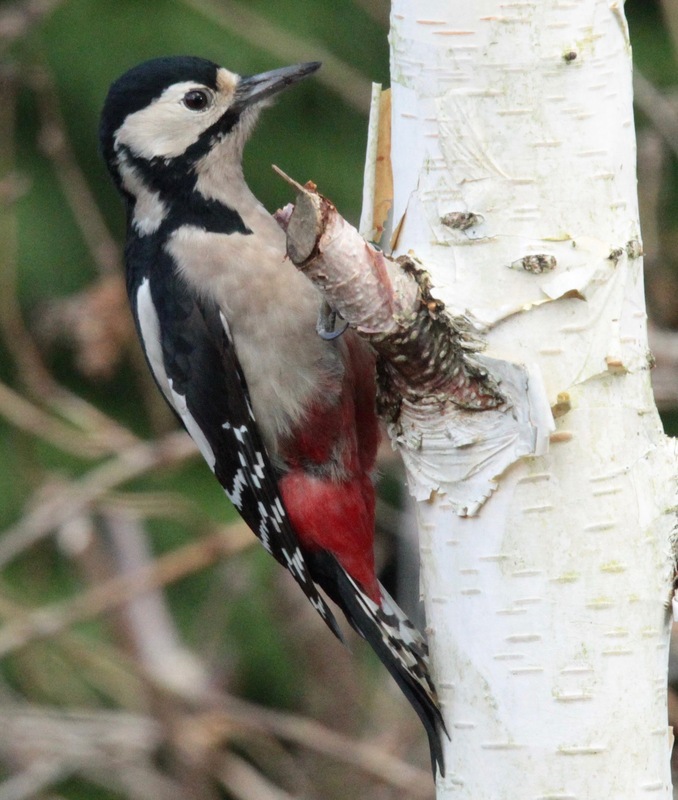 Great Spotted Woodpeckers are turning up on our feeders as usual but males can also be heard drumming on the tree trunks to establish their territories, which they will do until April. 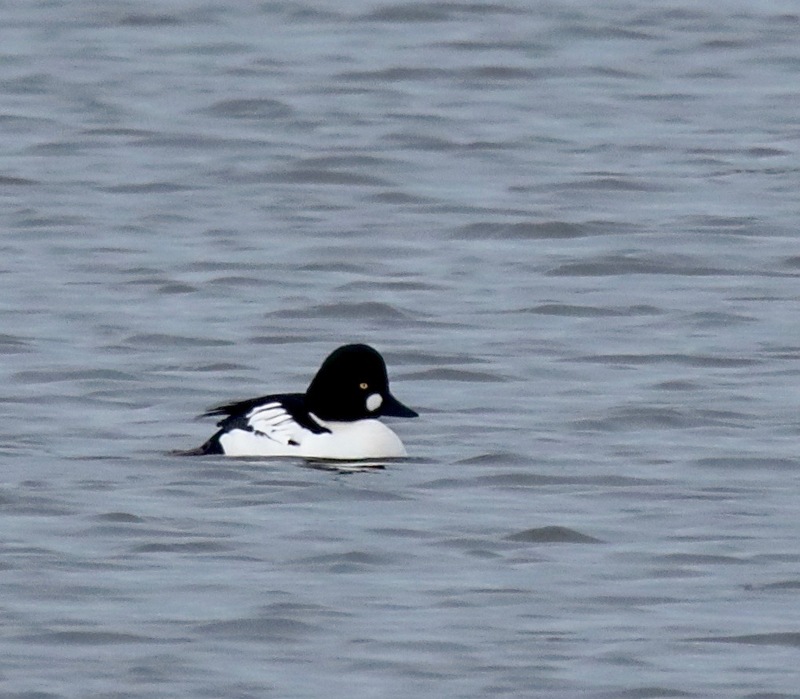 (Male have a red patch at the back of their head, females don’t – see photo’s). 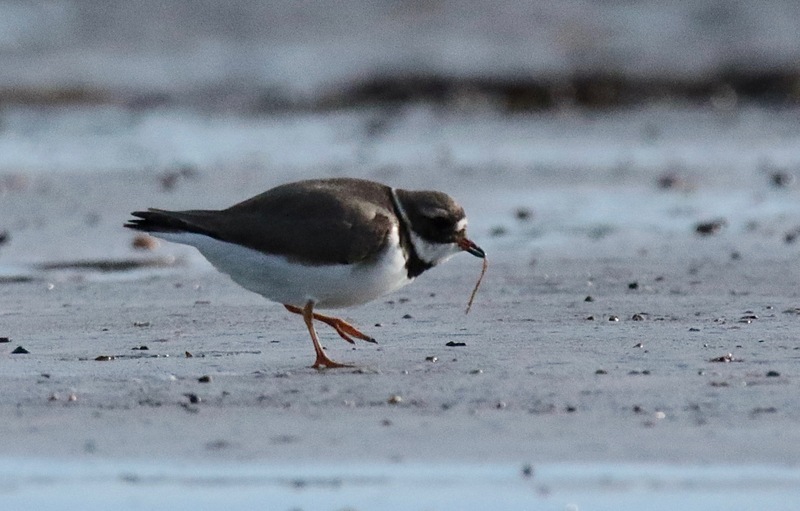 One of the success stories, their increasing numbers and spread mean you can hear them in most of the UK- we even heard one at Kelsey Park, Beckenham, at the weekend! They find the loudest drumming-posts, including telegraph poles. 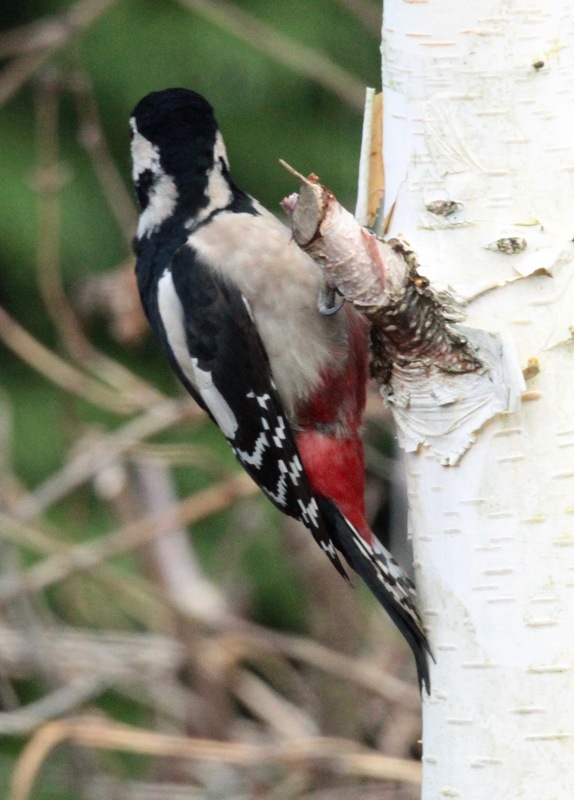 (Green Woodpeckers, while they excavate nesting holes in tree-trunks, do not drum). Conditions: Frosty and showery. Temperature: Max 5- Min 4C.